Yesterday while visiting the East Pond at Jamaica Bay Wildlife Refuge, in Queens NY. I was pleasantly surprised to hear and see Long-billed Dowitchers. Two birds dropped in on the pond and I enjoyed good views. Long-billed Dowitchers are not common for our area and is always tough to pick them up during the summer in their breeding plumage when mixed in with Short-billed Dowitchers...especially if an LBDO male is next to a female SBDO. Careful birders, rely on a combination of field marks along with the calls to pick them out. Juveniles are easier to pick out. With these two birds, one could easily be fooled into thinking the one with the shorter bill is a Short-billed Dowitcher while the one with the longer bill is a Long-billed Dowitcher. A few photos are posted here for those interested in studying the plumage at this time of the year. 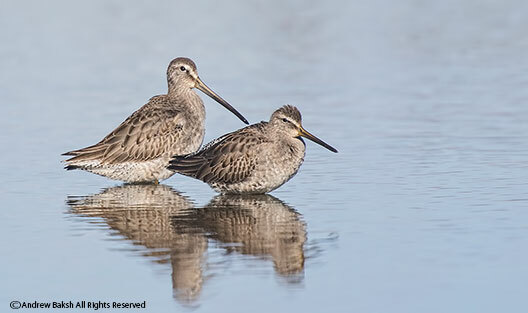 These are both Long-billed Dowitchers. 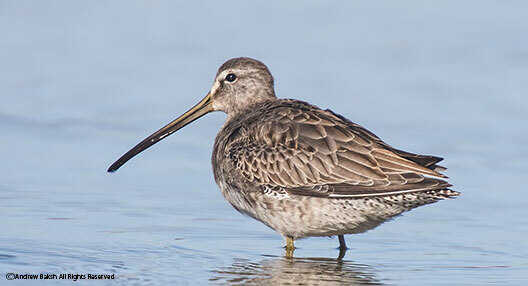 Long-billed Dowitcher...probably a female given the size.